Onkyo enters the TV soundbar market with three models, from £299 | What Hi-Fi? 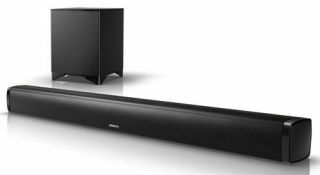 Onkyo is making its first foray into the increasingly popular soundbar market with three models: the Onkyo LS-B40 (£299), the LS-B50 with 40W wireless subwoofer (£449) and the LS-T10 TV speaker system (£349). The latter two models will be available at the end of September, with the entry-level LS-B40 (below) arriving in October. All three products combine a six-channel digital amplifier with a multi-speaker array and DSP (Digital Signal processing) to help boost the sound from flatscreen TVs, which frequently suffer from poor audio quality due to the limited space for speakers within their increasingly thin frames. Wireless streaming of audio from smartphones, tablets and PCs is catered for via built-in Bluetooth, and USB ports allow for connection of flash-memory media players. Both the LS-B40 and LS-B50 soundbars are fitted with eight drivers. The LS-B40 has four midrange units, a pair of tweeters and two bass woofers, while the LS-B50 (below) gets six full-range drivers and two tweeters, plus that wireless sub. As for the Onkyo LS-T10 (bottom), it's designed to sit underneath the TV (like the Bose Solo). It's equipped with six full-range drivers and an integrated 21W subwoofer. All the Onkyo soundbars can be controlled using the TV remote control, as they come pre-programmed with IR codes for nine TV brands – and learning ability for others. Audio is controlled using Onkyo's AuraSphere DSP technology which can handle conventional PCM (Pulse Code Modulation) stereo or Dolby Digital signals. Several sound modes are available for users to choose from, depending on the type of material they're viewing: Music Mode, Movie Mode and News Mode, the latter placing particular emphasis on dialogue.